22″ class Hospital Grade LED HDTV with Integrated Pro:Idiom. 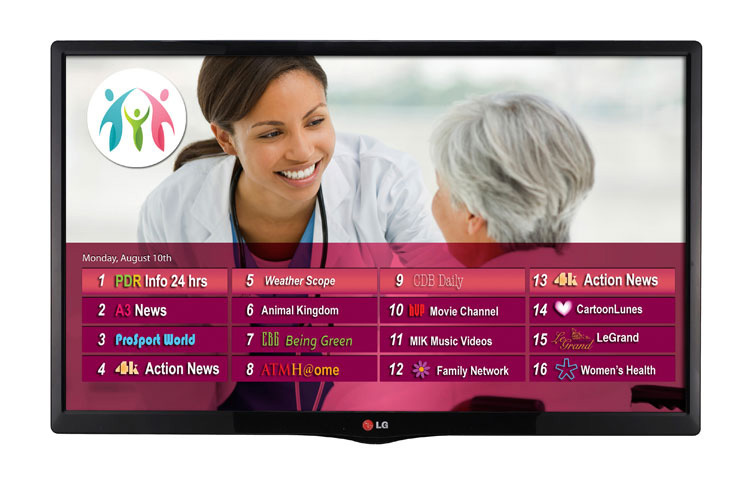 An industry leading television that supports the Pro:Centric platform, LG’s new LY560M Series Healthcare Pro:Centric LED HDTV allows healthcare facilities to customize the patient room experience. Pro:Centric provides an easy way for the LY560M to interface with interactive program guides, games and internet data feeds, as well as applications designed to connect patients to services such as dietary menus and patient room information. Using LG’s optional Pro:Centric server, you can remotely manage cloning and channel mapping for TVs in patient rooms without having to visit each room. EzManager’s auto configuration function makes installation quick and easy. EzManager guides the installer to set up the TV with simple steps without having to set up the menu manually, saving time and cost. The LY560M Healthcare TV has a convenient time and expense saver feature. A select number of Commercial menu items are cloning capable. This allows the cloning of a master TV to all other TVs of the same model. This can be easily accomplished by using a standard USB memory device. This time-saving technique will allow the installers to program the preferred commercial settings from a master TV to all the required target televisions in a hospital facility in a matter of just a few minutes per TV. The estimated annual energy cost determined in accordance with 16 CFR Part 305.5 for models 42LY560M, 32LY560M, 28LY560M, 22LY560M are $7, $5, $4 and $5. “Your energy cost depends on your utility rates and use. The estimated cost is based on 11 cents per kWh and 5 hours of use per day. For more information, visit www.ftc.gov/energy.” 1FTC Television labeling rule (18 CFR Part 305, as added by 76 Fed. Reg. 1038 (Jan 6, 2011)).